Another collection of observations lie below. Whilst each Elder Scrolls game becomes more fanciful and magical as the story develops, there are still aspects of the game that make absolute historical sense and other aspects that don’t quite fit. Skyrim begins with your execution. Luckily for you, the execution is interrupted. This is very fortunate; decapitation would really spoil all that time spent getting your hair just right in the character creator. Your execution is postponed by the arrival of a big ol’ dragon. And yes, there’s historical accuracy here. This extract is old school propaganda. The monk that produced this piece was intending to emphasise all the evils that signal the arrival of Viking raiders. Their message is brutally clear: where there are Norsemen, there are dragons. 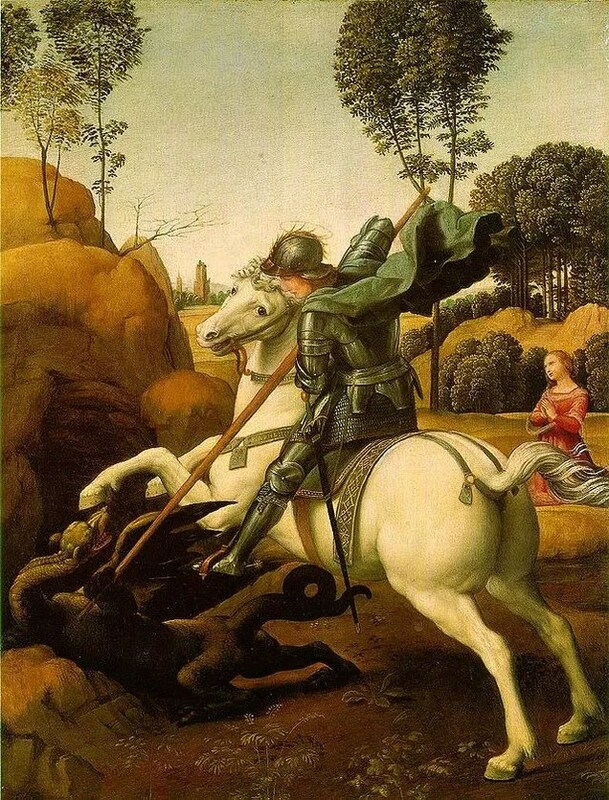 This is Saint George, the Patron Saint of (way more than just) England dealing with a dragon. In almost every depiction of this scene, he’s fighting a beast the same size, or smaller than, the horse he’s riding. 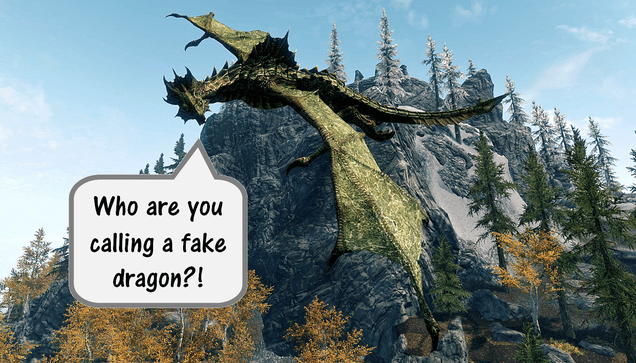 Sorry Skyrim dragons, it’s doesn’t matter how hard your roar; you’re not a real dragon and you know it. There are several varieties of horned and spiky armour in the lands of Elder Scrolls. The horned helmet is especially prevalent in this instalment. Whilst these items carry a distinct level of visual bad-assery, in reality the horned helmet is a ridiculous as it is entirely illogical. When you put on this piece of headwear, you do look like a Viking, but not a Viking from the 13th Century. 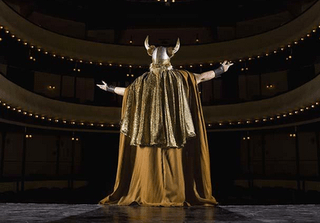 No, you look like a Viking from an 18th Century opera, which is where the myth of the horny helmet began. And then there’s the lack of logic. If a warrior walked onto a medieval battlefield with horns on their head, they are either going to find themselves dragged to the ground by the make-shift handles, or their opponent is going to grab the horns, lift the helmet off their head and beat them to death with it. Needless to say, my character won’t be wearing one. I won’t allow it. Having said that, it’s not like there aren’t examples of headwear and armour from History that substitute practicality for fabulousness. The Roman centurion sported a giant Mohican-like brush atop their helmets so that they could be easily identified. 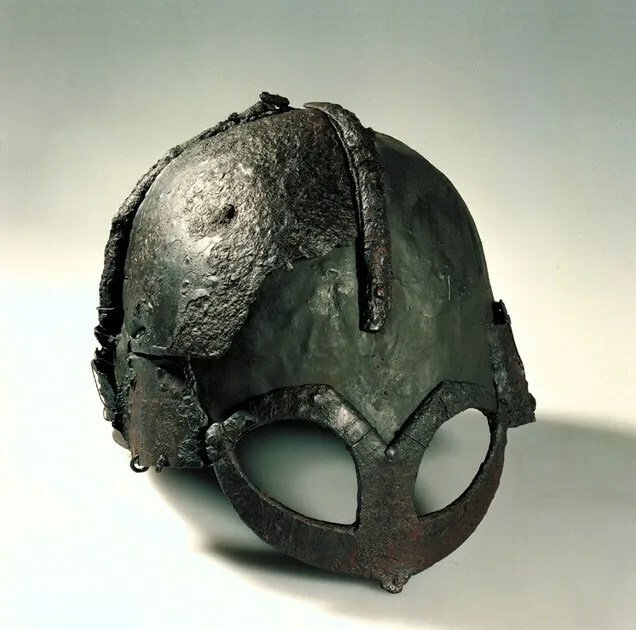 Whilst the majority of helmets in Skyrim follow the Viking and Saxon practice of leaving most of the face uncovered, we’ve all seen how knights from the 15th century would encase their heads almost completely in metal. 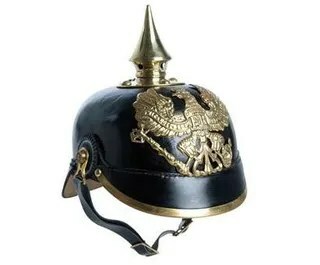 Not to mention the spiked ‘Pickelhaube’ helmet that the German army was still sporting in 1914. 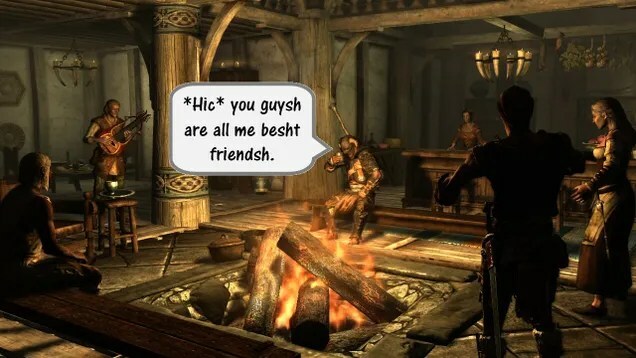 How many glasses of water has your character drunk in Skyrim? That’s right, none. How about alcohol? I’ll bet you’ve seen plenty of wine and mead lying around, and that isn’t too far from reality. We enjoy running water courtesy of an advanced network of plumbing, and water sealed in bottles. In medieval times, water was a difficult thing to keep fresh. Anglo-Saxon villagers would drink substantially more weak beer than water, because the former is easier to store. Wine is a drink usually consumed by the higher class of medieval society; it’s something that Europe has been producing since the Roman era. Wherever you enter the main hall of the castle keep, you can expect to find a vast table covered in fine foods. This is another (mostly) accurate reference to the life of nobility in the middle ages. 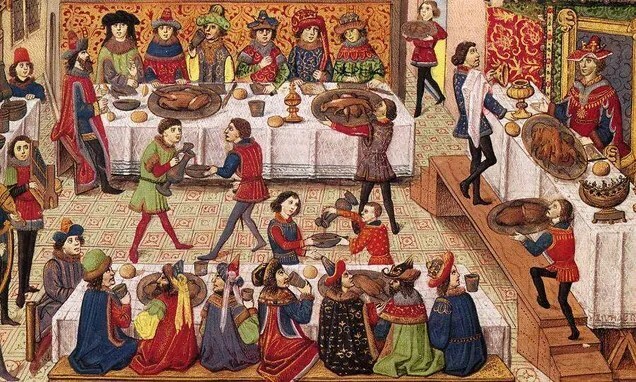 A king and his council could consume up to 6,000 calories in a day. Three times more than what is needed. The fattening effects of this luxurious lifestyle where counteracted by the very physical hobbies men would have during this time. Wrestling, jousting, hunting, dancing and other sports kept the nobility lean. When they were feeling particularly bored, they could declare war on a neighbouring kingdom. A fight to the death can do wonders for your waistline. So when you wander into a villager’s home and find nothing but veg and berries, you know that’s historically accurate. If you find deer meat amongst their possessions, that’s a bad sign. If a peasant was found hunting deer during William the Conqueror’s reign they’d have a hand cut off. If they were stupid enough to try hunting a second time, they’d be blinded. A tad unfair, to be sure. Skyrim continues to take inspiration from History, and most of that fantasy elements are based or ideas and beliefs from the pages of History. It’s important to remember that almost every creature or monster you see in a fantasy game can be traced back to an idea or belief that is centuries old. Even though the horned helmet is an historical misconception, we can still use history to explain where that misunderstanding came from. Even the most basic ingredients in the game, like the foods lying on banquet tables, have grounding in reality. 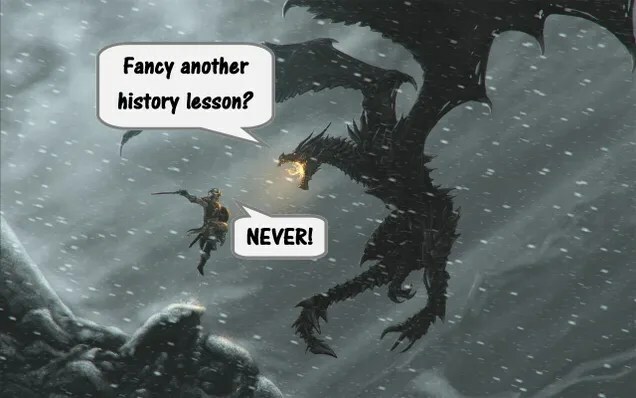 Skyrim might be a game that lets you throw lightning at dragons, but there’s no denying that it owes a lot to the awesome nature of History. You can contact the author @RedHeadPeak. You can also visit the full blog here.